Deep in the heart of Tucson, order lives. In neat, sweet categories like, pets, cooking, health, women’s issues, travel, kids. Books lined up on long blonde shelves. Kids books on the lower shelves (how thoughtful! ), travel and finance on the top shelves. What secret saint did this? Made order from chaos? Add to all of the sweetness and order some savvy marketing on the top of the shelves: groups of books, artfully arranged, displayed to take advantage of our browsing gene. This is no bookstore. This is no library. It’s the Goodwill store near 4th street. Dubbed “the most expensive thrift store in Tucson” by the proprietor of the store next door, this Goodwill store has an advantage. 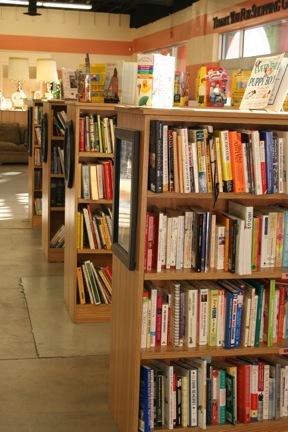 Someone has done serious thinking about how the folks who use the store will look for books. And set up a system that makes sense. And maintained the system. Who is the person? They have the soul of a librarian. The insight to provide an extra bit of service that makes the life of the book buyer a little easier, and a lot more fun. Whoever you are, thank you. What a great post! Witty, charming, and absolutely delightful. I agree. That Goodwill has the most neatly organized books I’ve ever seen in a thrift store. Andrew, you are my rock! I suspect that you are the rock for others here, too. Thank you for the handouts, the support and laughter. I love how you saw the details about the books that others might not notice. I love how much you care about both the books and the readers. Charlene! It has been a true pleasure meeting you. What an adventure we are on! Thank you for the reply. I tracked over her from Kates Blog and I want to tell you that I love the concept of your blog! I’ve book marked it and will enjoy following your thoughts. Shirls – Why, thank you. It has been a remarkable workshop. The seeds of inspiration are just beginning to sprout . . . thanks for the support. Surely you must have found the coolest, smartest Goodwill store ever!! Welcome to Blogland, I look forward to reading about your adventures! Wish I was there with y’all!! Me, too. Wish you were here. We will make a time soon. Thanks for the reply! I love your prose. It has been a real joy to have spent this time with you. I look forward to following this blog as I think it will provide many thought provoking posts. Likewise, hanging out with you. I love your enthusiastic spirit and appreciation for detail, like the percentages on the map. How cool is that? You are interesting and interested in the world.